Posted on February 24, 2014	by Katy K.
Remember there’s still time to enter my Tenth Anniversary Giveaway! 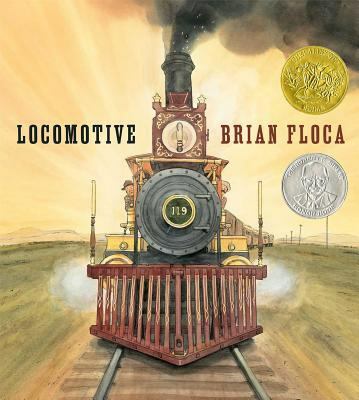 Locomotive by Brian Floca. Simon and Schuster, 2013. I checked this one out after reading Amy’s review over at Hope is the Word. Gorgeous layered illustrations with expressive typography and poetic text tell the story of a family traveling west by rail in the 1860s. It was Cybils Middle Grade Nonfiction finalist and – more power to Amy for her prediction skills – won this year’s Caldecott. It is beautiful to look at and very informative with lots about the way the train works and the various people it takes to run it as well as the landscape it travels through. It’s also very long – more of an elementary school length than a preschooler length. I read it through, but couldn’t convince either of my kids to let me read it to them. That has much more to do with neither of them liking trains especially than the book itself. It would do very well for any train or history lover from kid through adult.